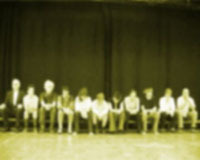 War & Peace has arisen out of a theatre course exploring Voice, Movement and Text. It is a work-in-progress rather than a fully-blown performance, the idea being to give the performers, some of whom have never been on stage before, the opportunity to perform in relatively relaxed circumstances. Each performer has chosen a text on the theme of War and Peace. The performance is a ‘cabaret’ of these different texts.